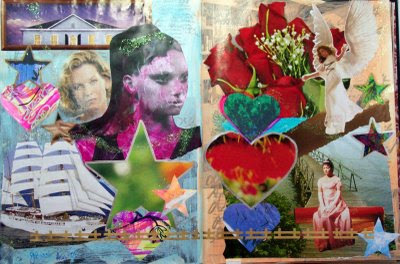 A Treasure Map is a special type of collage that is like a visual affirmation. The map-maker collects images that reflect the fulfillment of a goal, vision, or dream, then arranges the pictures on a backing-board and pastes everything down. Lots of old magazines (I scavenge at the public library) and glue sticks have been used in this process! And I can't resist embellishing everything with glitter, stickers, and metallics. The Bouquet means receiving $$$$$. The Ship means success in trade or ventures. The Lady means gentle support from friends. The House means success in projects. The Angel means divine guidance. The Bridge shows a path to a happy future. The Heart means troubles aren't as serious as they fear. The Star means a guiding star, and that worthwhile ideas and efforts will bring success if pursued. My first ventures at Treasure Mapping really took off when I began doing it with a group. We'd spread our picture stash on a big table, hand out the scissors, cardboard, and glue, and get going. It was amazing how silence reigned in this otherwise talkative group during the construction of the Treasure Maps. After about an hour, we'd finish our creations, and show and discuss them with each other. I always felt so much better about my journey after this process. The group, sadly, is no longer active though we still keep in touch. Looking back, I can that these gatherings were the springboard for my collage career. Taking classes refined my skills, but the old Treasure Map nights gave me the "Aha" that said I can do this. The Treasure Map I did for this post tells me that, even though I'm not getting immediate strokes for my efforts, I'm on the right path. That is very reassuring, and I need constant reminders because I'm someone who thrives on immediate gratification! Which reminds me of another feature of the Treasure Maps: you have to see them every day. Many a Treasure Map has been posted in someone's bathroom, or hung over the bedroom dresser. I still have maps from three or four years agog this Treasure Map as a gift to anyone who needs a guiding star to follow right now. posted around my house. And now that I have a digital file of this image, it's brilliantly displayed on my computer's desktop background. If this image speaks to you, feel free to use it for a similar purpose. I am giving you permission to download and use this, and only this, image, for personal, uplifting purposes. (But don't sell it, please - that's tacky - however, if you do find a way to make $ from it, let me know:-) I'm offering this Treasure Map as a gift to anyone who needs a guiding star to follow right now. Enjoy, and please let me know how you've let it help you. *Winds of change: see the Empty Vessel CycleCast dated August 17. Here's a cute little fish, ready to swim into your heart, or that of a friend. This is my own creation, an ACEO gift card. ACEO stands for Art Cards Editions and Originals - it's like a trading and collectible card for artists. Did you know that in Feng Shui, fish are symbols of luck and success? You can use this card as a feng shui enhancement to bring good energy flowing your way. 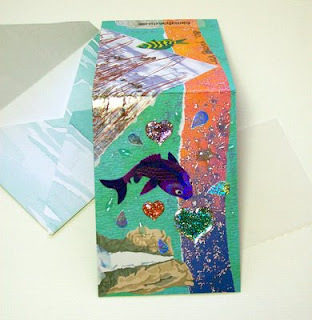 My fish card folds to 2.5" by 3.5", which is the standard size for ACEO. It comes with an envelope and a piece of vellum for writing your message. The charm of ACEO's is that they are an affordable way to own an original piece of artwork. Many people collect them; I've even heard them called addictive! 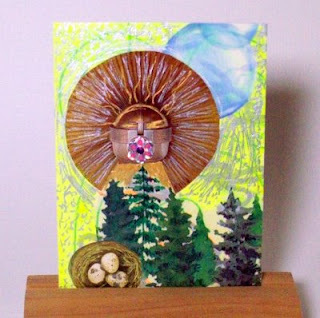 Well, I wouldn't want to call myself a pusher, but I'd be happy for you to take a look and maybe even buy one or two:-) Prices are currently $6 for the gift-card ACEO, and $5 for the standard ACEO (see the sun-face card illustrated below), plus shipping. You can see them all at EclecticaByJan.etsy.com. Now, let me tempt you with some advance pictures of a work in progress. I'm crocheting a beautiful, lacy afghan in the most gorgeous tones of frosty blue. It's being made out of a Lion Brand yarn called Homespun - a thick and scrumptiously soft yarn that's just perfect for keeping you cozy. Don't you just want this for winter nights with a good book and a fire? Never fear, I'll post a big announcement right here when I get the Blue Lace Afghan listed for sale. I do think the blue shades in this yarn are so soothing, but if this isn't the right color for you, talk to me! 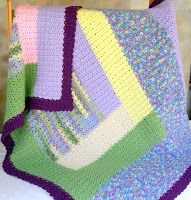 This afghan, and most of my crocheted work, can be made to custom order so you'll have the colors that are right for you. You can email me, or use the "contact" feature on the Etsy site. I'm always happy to hear from you! Did you feel the energy shift yesterday, fellow-travelers? I sure did - right around 4 pm, just as the lunar eclipse was about to happen by Mountain Time (4:16 pm, to be exact), my mood lifted, as if a cool breeze had carried away all the old doubts and worries. Of course, a thunderstorm had just passed through my area, and that always brings a refreshing change of mood to the high desert where I live. We start with a fresh beginning, ready to explore new spaces. Use your clear-seeing Eye to guide you, traveler; it's a gift you've earned from your latest challenges. Like the Magician, you have a choice: you can make things happen, or simply allow them. Now we can sail on the Winds of Change: with the Sand under our feet, we're ready to flow in all directions. So, where to next, fellow-travelers? If all that wind and change and sand gets to be too much, you may be tempted to dig a Hole and crawl in it. Better to see it as a vase, or the Taoists' Empty Vessel. Like an empty vase, be ready to receive new input and stay open to all of the possibilities. Life is but a journey, and for these few weeks, we don't need to know where we're going. The important thing is to have fun getting there! This CycleCast is in effect now through September 5, with a peak on August 25-26. Where are the winds of change taking you? These CycleCasts are terrific guides, but they are generalized to apply to everyone. For the times when you need a better road-map, my Intuitive Readings are just the thing. To request a reading, send an e-mail to burchjan@gmail.com. For more information about holistic consulting services, visit my website, www.GeoGlowConsulting.com. You'll be glad you did! IMO is blog-speak for "in my opinion"
Internets is G.W.Bush-speak for "the Internet." ;-) is a smile with a wink! To get back on topic, part of my journey took me to two social-network sites for bloggers: BlogCatalog.com and Zimbio.com. The rest is history - my nightowl habits fit perfectly with obsessive bloggers around the world who stay up to all hours, posting discussion topics and surfing each others' blogs. Through it all, my knowledge of blogging has expanded, my blog has become more colorful and (hopefully) improved, and my readership has increased. Heck, I didn't even know how to track my readership before I joined the social-nets. And it has all come from BC, or BlogCatalog, as we affectionately call it. Zimbio gave me a really pretty profile page, and my blog posts looked gorgeous in their site, but I've gotten no readers - maybe one view from Zimbio in all the time I've been tracking. So I'm out of there. I deleted my Zimbio button from the sidebar last night, and now I'm heading over to remove my blog from Zimbio's listings. Sometimes you have to cut away what doesn't suit you, as the latest CycleCast has said. Because it's all about getting readers. And, I am ready to go to the next level of readership. Right now I'm averaging 9 readers a day, and I'm aiming for the double-digits. Yes! 100 readers a day! That's not out reach, and I will be exploring other linking means to bring up my blog's visibility. Meanwhile, you, my dear readers, can help me. See the little icon - it looks like an envelope - in the lower-right corner of each post? Click on that and you can e-mail the post to any of your friends! Surely you know folks who are interested in the CycleCasts, or the handcraft journey, or the political ruminations. Or, you can subscribe to my e-mail UpDate letters, and forward those on to your friends. It's easy, it helps me out, and expands our community in this little corner of the Blogosphere. I am both sorrowful and outraged today, fellow-travelers. I'm sure by now you've seen yesterday's news reports about the murder in Arkansas, of the state's Democratic Party chairman, who was gunned down in his office. Since the perpetrator was also killed (by police), we can at this time only speculate on his motives. But consider this: Last month, two members of a Unitarian Universalist church in Tennessee were killed, and others wounded, during services. And in this case we know exactly why this blood was shed, because the killer left messages: he hated liberals. A little thoughtful reflection will show that there's a pattern here, perhaps a logical outgrowth of the anti-liberal, anti-progressive, and anti-Democratic invective that has flooded our public airwaves for years. It's come from talk-show hosts whose names are almost code words for lying, vicious bigotry: Coulter, O'Reilly, Limbaugh, Malkin, ad nauseum. It long-ago spilled over into the mainstream media, now affectionately known as the MSM in blogosphere-talk. No, the MSM doesn't chant "kill liberals" like the above-mentioned talking heads; the nightly news simply gives them a free ride by parroting their inanities as if they where unassailable facts. Which they are not. So it has come to this: Today in the United States of America, decent and ordinary citizens are being murdered for their political beliefs. As someone who has grown up believing in and actively participating in democracy, I want to hang my head and weep. Let us pause now for a moment to send light and love to the bereaved families of those killed in these tragic events. To lose someone who was murdered in a workplace or place of worship is bad enough. But to have your loved one killed for their political beliefs must be the pinnacle of agony. My heart goes out to you in Arkansas and Tennessee who are burdened by these losses. Now, where do we go from here? Campaign offices will no doubt be looking to increase security. It's a wise idea, given that copycat crimes are an unfortunate likelihood. But it would mean the terrorists have won. It also diverts precious energy and resources away from the vital job of getting candidates elected who can turn this country around. Others (see the discussion thread in the link I posted above) have examined the contributions of those pundits who spew the hate. I definitely believe they share the responsibility, although of course they will shirk it. Hey, hatred sells, don't you know? Why would they give up their share of the profits that come from rousing the disaffected to turn a gun on the nearest liberal target? But advertisers are acutely sensitive to public reactions towards their products, and calls are being made to put pressure on the advertisers that support these right-wing "news" shows. I think that approach that's worth pursuing. But, in my view, the most important thing we can do is to keep speaking out. The thought that we might receive violencefor expressing our liberal and progressive views is chilling, but as the fortune cookie says, If you are willing to die it is easier to live. I know many of us have had unpleasant encounters because of our bumperstickers and our yard signs (my house was egged in 2004 when I had Democratic candidates' signs in my windows). We still must be brave and carry on. I personally have only had that one unpleasant event; by far the reactions I get to my signs and stickers are positive. Now is not the time to go quiet - we have done that far too long. Stand up, speak out, be proud of your liberal positions for they are shared by the majority of citizens in this country. Poll after poll says so! And support those who continue to do the hard campaign work of getting out the vote. It is so vital now, more than ever. You can start speaking out right now, right here by leaving a comment. Once you take that first step, the next ones come easier. Eclectica By Jan has its first sale - and I get another fine growth experience! Here's a picture of my very first ~sold~ item from my new Etsy shop! 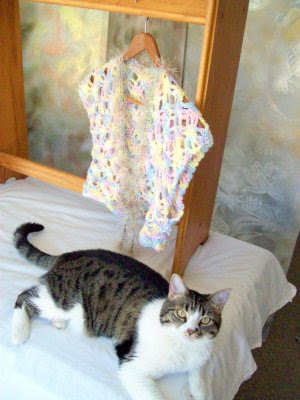 The Impressionista crocheted throw was mailed today, off to make a young lady's room happy with comfort and color. Yippee! It was a happy moment for me, even though I was just a bit nostalgic as I folded up Impressionista and nestled her within the tissue paper in the shipping box. We'd spent a lot of time together, before I finished her up, photographed her, and posted her on Etsy. 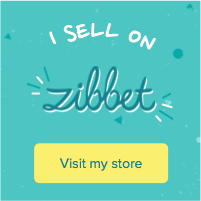 You see, from the first, when I hatched my vision of setting up this online shop, I wanted it to be more than an outlet for my creative hobby. It certainly is a creative outlet - it's amazing how the chance to earn has given me a focus for pursuing my artisan passions - but I want and need an income-generating stream, as well. I mean, I really need this potential income! So, I worked my tail off for several months getting everything ready, taking photos, opening accounts, creating a banner, writing the copy - all that stuff. I posted my Grand Opening announcement here and sent it out to several contact and discussion groups. I did all that marketing stuff that I was supposed to. And then I waited, and waited. Okay, I didn't have to wait that long - it took less than two weeks to get my first sale, for cryin' out loud Jan get a grip! (Patience is not one of my virtues.) And I also waited for some positive feedback (kudos, strokes) from a certain set of folks that I was expecting to hear from. And I waited some more. Now, if you remember my previous CycleCast, I said we've been in a time of blocked energy. There I was, trying to find a way around my Block called fear of financial insecurity, which can do terrible things to people if they let it take over them. So I'm trying to remember my own forecasting advice and keep myself calm, while waiting for the money to follow my doing what I love. It wasn't working. My mood kept getting funkier, and funkier, and funkier. What was going on with me at the time? I can't say I was afraid of being found inadequate - I know my works are good. With the money thing foremost in my mind, fear of failure was in the mix. Like, how dare I put myself out there and then not succeed? But the biggest piece of the emotional brew was this familiar little twist called athazagoraphobia - fear of being forgotten, ignored, blown off. Yes, I've had that "friend" hanging around me for a long time, but I've only recently learned the word for it. On Monday morning I sat down and wrote another message to the group I'd been expecting to hear from to. Looking back I am not proud of how I whined and sniveled in that message - though I sure did a good job of whining and sniveling! Poor me, no one replied to my message, waaahhhhh. At least I got my feelings off my chest, so I was able to go do a few productive things that day. Then, when I got back to my computer a few hours later - there it was (long story short) - my first sale. Yiippee! Instant mood change! If you want to see God laugh, tell him your plans (or expectations). Expectations, it has been said, are pre-ordered resentments. How well I know the truth of this, yet I couldn't stop myself from having expectations. Is it maybe just part of being human? Sometimes we have to authentically express our pain, show our warts and all, and then let the chips fall where they may. We all need to give, and get, support from each other. Often in our busy lives we pass up the chance to do this. A little reminder now and then doesn't hurt. Just remember, we're all doing the best we can. Back to the real world: I've started another afghan to fill in the place of the one that was sold. (Gee, I could stay really busy doing this.) 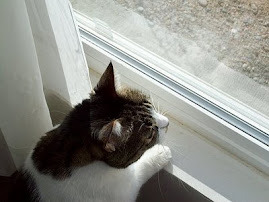 I'm thinking of adding a feature to this blog called Ask Psychic Jan. And I'm waiting for the full moon's eclipse energy to cast the light on the next CycleCast. Sound interesting? Stay tuned, fellow-travelers, and peace be with you. The universe is laughing at me, fellow-travelers. Ever since I wrote that CycleCast about how everything was going to be wonderful (see the August 1 post), we've more turmoil in the world: earthquakes, church shooting, hurricanes, climbers lost in the Himalaya, the FBI back in the news and looking the worse for it, and, in a bizarre turn of events, a politician and a celebrity in the battle of the TV ads (so far the celebrity is winning). clearly what needs to be done, or simply let it melt away. The path ahead of us has two forks. The shortest way leads to the Powder: Short and sweet, but we'll get worn down to a fine dusty essence if we go through this mill. Better to take up our Wand on the second road, and shoot the Arrow straight towards our goal. That's how we'll find the key to unlock the gate across our path. What it all means, dear readers, is that this CycleCast is all about attitude, which (by the way) is the only thing we can control, and the mental shifts we need to make in order to work through our challenges. We're definitely in mid-Cycle now (that always feels like slogging), and challenges abound. This is perfectly normal for the two-week period between eclipses. And, also normal for this progression in the moon's journey, is that we'll shortly move out of the hard phase of the challenge and shift into the Ah-Hah mode that signals the answer. Be careful what you ask for, however, for we'll be grabbing onto some strong manifesting energy in the coming weeks. Keep your thoughts clear, and know that it's all going be good. This CycleCast has been in effect since the August 1 solar eclipse. 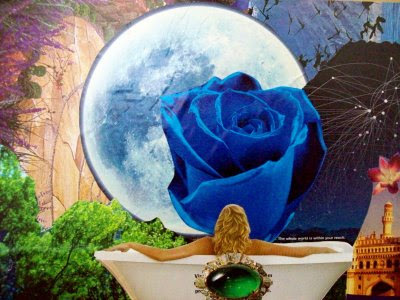 The energies will reach their first peak on August 12-13 with the moon in Capricorn, and peak again with the lunar eclipse on August 16. For a few days afterward, we'll have some time to wind up this manifesting energy, with the Cycle concluding on August 24. Never fear, I'll have more blog posts before then, so mark this site and keep coming back! You've been hearing about it for weeks, fellow-travelers, and I've been working on it for months, and now it's happened ... drum roll ... tah-dah! My Etsy shop, Eclectica By Jan, is now open with ~13~ fabulous items for sale! And most of them are made by hand - by me! I am offering a selection of crocheted afghans and wearables, along with a set of note cards (and more to come), plus my signature tabletop labyrinths. Rounding out my offerings are five vintage patterns from my long-time collection. You can see a sample of my wares in the sidebar to the right. Everything in that cool little widget is linked, so you can easily get to my shop from here. Just so you know - Etsy is a website that supports artisans in selling their original, handcrafted goods online. I owe my friend and visual journaling teacher Juliana Coles a big ~thank you~ for first telling me about it. I'm finding that Etsy is not only a store, it's becoming a much-welcomed community in my life. And just think, every time you buy handmade from an artisan, you're helping to break the corporate stranglehold! For the registration-shy among my readers, I can tell you that you don't need to register or log in to my view my shop, or surf the Etsy website (warning: it's mildly addictive). You do need to register to give me a heart (that means mark as a favorite), or contact me on the site - both of which are always appreciated. You definitely need to register to buy from me - and that's not a bad idea, either:-) In any case, Etsy is good about keeping e-mail to a minimum. The only emails I've gotten from them have been directly related to my business. So you don't have to worry about getting your inbox flooded. Just saying, because I know some of you are very protective of your computer space. So where do I go from here, now that the big push to get the shop open is complete? Well, after I catch up on basic things like laundry and getting bills paid, I have more projects in mind. It may not be cool to say this, but for me there's something about having my works out there in a public forum that is a huge stimulant to creativity. And I really do hope they sell - I can't say I'm not in it for money. The second income will be very welcome to me, and may it continue. But I'm even more passionate about the creative process. I'm now working on some prototypes for new crochet accessories with a lot a sparkle in them. Ladies, watch for some dazzling crochet wraps that will really zing up your party wardrobe. Another idea is to make some embellished clothing and table mats, and may be even boots, dressed up with rhinestones and other bling - pure fun. (Did I tell you I like sparkly things?) And there are always more afghans to be made. I really like this picture because I think the colors harmonize so well. I had to crop it to use in my Etsy gallery, but here's the full shot showing (almost) all of Luvlee. Just like this blog, Eclectica By Jan will always be changing and growing. So bookmark, add to your favorites, subscribe to the RSS feed, get on my email contact list, or however you want - just remember, you can always keep coming back!